Over the last half year mapillary has grown in popularity with over half a million photos uploaded, more than 100k in the last ten days alone! And this is despite the fact that at first glance it feels like you have to use a normal hand-held smartphone to do the job. What if you could use a mounted action camera, like a GoPro to take photos for mapillary? Mounted on a bicycle, helmet, even a car? It turns out you can, and last week I did a little drive and collected about 1700 photos in half an hour using TimeLapse, consuming only 3.4G of my 32GB SD. I could have driven for over four hours and taken around 150k photos before filling my card! 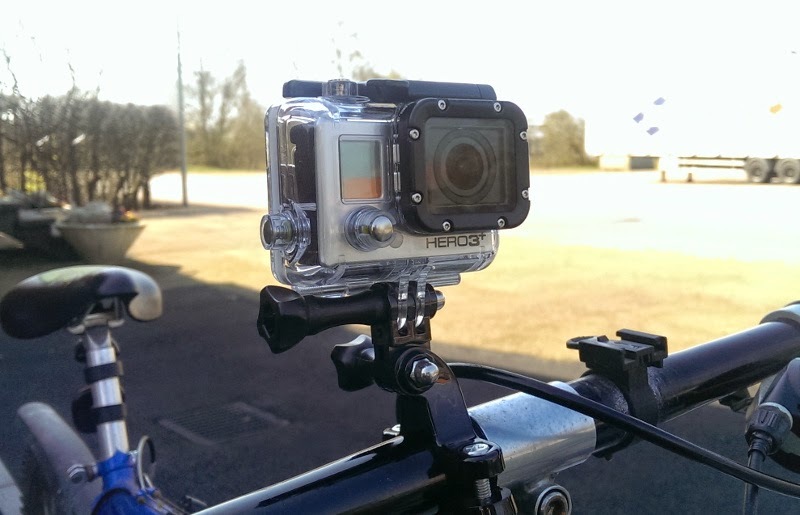 Mount the GoPro somewhere, on a bicycle or car using the various mounting accessories available. Start a GPS tracking app. I used geopaparazzi, but there are many others that will work just as well. Configure the GoPro to take time lapse photos. I choose 5MP, medium, narrow, 1s. Start the GoPro and go for a drive or cycle tour. Upload the photos and GPX track to a computer. Geolocate the photos using time-correlation to the GPX track using gpx2exif. Upload the photos to Mapillary. OK. That doesn't sound too difficult, right. So let's describe these steps in more detail, using the drive I made last week. I mounted the GoPro onto the front left fender of my Mazda RX8 to get a nice view of the center of the road. Then I mounted my HTC One into a dedicated HTC mount inside the car. Using the 'GoPro App', I could connect to the camera and get a preview of what the GoPro can see. This is convenient, but not really necessary, as the preview disappears as soon as the recording starts. It is sufficient to just have the phone lying in the car somewhere, as long as it gets a good GPS signal. If you do use the GoPro app, take the opportunity to go to the settings and set the camera time to minimize the time difference between the two devices. As you'll see later, you will need to correct for differences in order to perform a correlation, and the smaller the correction the easier the job. Make sure the GoPro is configured for time-lapse photos with the photo settings you like. This is easy to achieve using the GoPro App, but can also be done on the GoPro itself. I chose 5MB, Medium, Narrow to get a view I felt was a somewhat similar to what I would see with my phone, with a focal length of approximately 20mm compared to a 35mm camera. The GoPro defaults to very wide angle views with a lot of distortion, so I avoided that for this drive. In another blog I plan to describe an alternative scenario where I got mapillary photos from a wide angle 4K video stream. That was more complex, so we'll skip that for now. With time lapse I selected a 1s time gap to give about 1 photo every 10-20m for speeds between 40 and 80 km/h. The mapillary default of one photo every 2s is more suitable for cycling, and I was certainly planning to drive faster than I cycle! Start the GPS tracking app. In my case I used geopaparazzi. In this app there is a button for starting a recording. I clicked that button and accepted the suggested file name for storing the track. OK. Now we all ready to go. Just to start the camera recording and drive! When you have finished the drive, stop the recording of both the camera and the GPS. Now the real work starts. We need to perform a geolocation before we can upload to Mapillary. In Geopaparazzi, I exported to GPX, then used a file manager app to find my GPX file and email it to myself. For the GoPro I simply pulled out the SD card and plugged into into the side of my laptop and copied the photos over to a local directory. This produced a nice high res view of the entire map. Note the use of the -D option to put a big gap between the marker labels. This is necessary because the geotag default is set for much smaller tracks, like a quick bicycle ride. From the image produced, we can see the times and locations for key landmarks on the drive. We will want to zoom in on a few distinctive areas we can use to manually check that the camera and GPS clocks are synchronized, or determine exactly the error between them. We can correct for this error when correlating, so it is important to get it right. which produced the image above. I can look for a photo when going under the highway bridge and confirm the times. The EXIF data for this photo shows it was taken at 12:39:11. When looking at the map, we can see that we passed under the tunnel at 12:39:14. So we have a 3s error. We can use this in the geolocation process, but let's double check with another photo. I created a map of the track through Mörarp, because I could identify features like buildings and intersections. It is a bad idea to use any intersection that you might have paused at, like I did at the right turn above, but look for landmarks along the drive where you were sure to be moving. I looked at the first road to the right, near the top of the map, and found the following photo at 12:46:10. I've taken note of things I know to be at the specified location, the speed warning sign in the middle, the white marker on the right for the intersection, and the tree and lamp-post on the side. One interesting double-check you can also do if you happen to be in an area covered by google street view, is visually compare those images. In google street view we can see the speed warning, the intersection marker and the tree and lampost, but notice that the fence is not there an fir trees can be seen instead. Clearly someone has been building since the google car passed! Google said the image was captured in September 2011, which is about 2.5 years ago, so things can certainly change. I set the time offset with the '-t -3' option, and used '-v' to watch the progress. Since the script is actually wrapping the command-line tools 'exif_file', a new process is started for editing each file, and this can take a while, but in the end your images will have GPS information in the GPX. 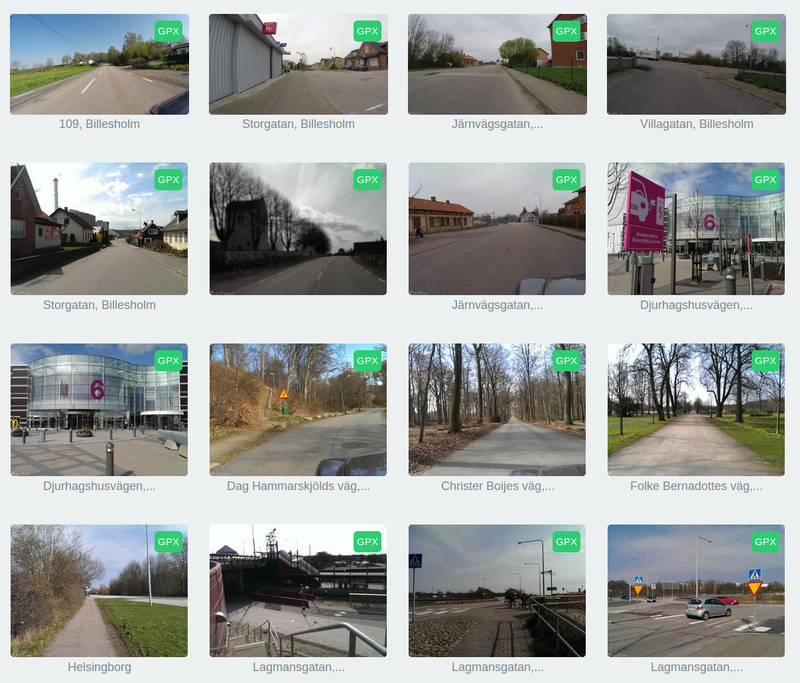 Once the images are geolocated, then you can upload them to mapillary.com. Simply login, then click on your name, choose 'upload images', then click the 'choose files' green button. Once the files are all listed, scroll to the bottom and click the 'Start Uploading' button. It will go a slightly paler green, so it is not that obvious that the uploads have started. 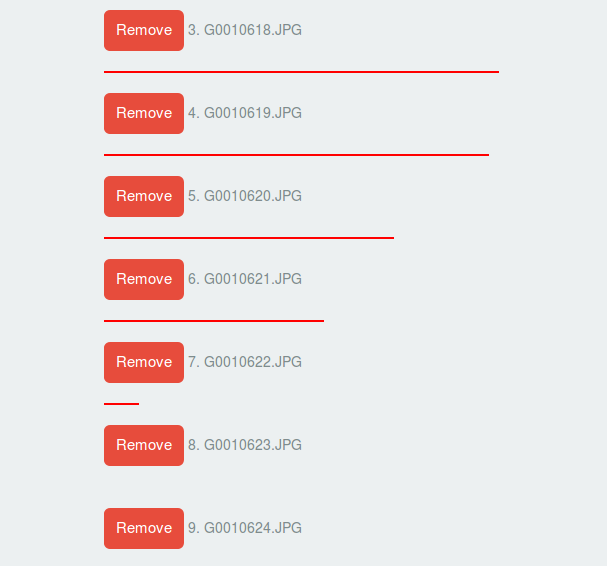 Just scroll to the top again and you should see thin red progress bars below each image as they are uploaded. And finally, once the upload is completed, click your name and select 'my uploads', and you should see a new image for your track. Click you most recent upload to browse the photos in mapillary! It might take time for the photos to be completely processed, so don't worry if they are not immediately available. Just come back and look a little later. In the meantime there is something else really fun to play with! This command compresses the 7MP 4:3 images to 960p HD video. Then I used OpenShot video editor to trim to 16:9, add audio, add the map, and compress to 720p medium quality for faster web uploads. In this blog we made extensive use of the geotag command. This command is included in the 'gpx2exif' Ruby Gem. For this blog we made use of features available in version 0.3.6. However, at the time of writing, the published gem was at version 0.3.1. So I will explain both the easy way to install (assuming we get 0.3.6 published before you try this) and the slightly harder way (if 0.3.6 is not published, or you wish to make changes to the script yourself). The first thing you need is Ruby. This depends on the OS. I use Ubuntu 14.04 and RVM, so I recommend you refer to ruby-lang.org and rvm.io for advice on your own platform. Here I'll give instructions for my OS, so you will need to make some adjustments to suite your platform. Then list the installed gems with 'gem list' to see which version you got. If it is not 0.3.5 or later, then use the instructions below. If all goes well, you will have built and installed the latest Ruby Gem. I'd love to see the tutorial of making it with videos. Nighto, the script described above already does work with video. Read the readme at https://github.com/craigtaverner/gpx2exif. There is a section on this. The reason I did not (yet) write a blog post for this is I think that using video only becomes a better idea if we do something more complex, like geotag images from the video based on distance, not time. So we get an even distribution of photos through the drive, instead of having too many near intersections (driving slowly), and too few on the highway (driving fast). I thought I might get time to add that kind of feature to the script before blogging. But feel free to try the existing video geolocating. Just check the readme for instructions. I got this working on a much earlier version in April, and have not tested it in a while, but see no reason why it should not still work just the same. For example, geotag -g log.gpx -v img.JPG -t 0 reports finding the same match as with -t 120. @pnorman, the -t option does not change the timestamp of the photo, but adjusts it in memory in order to align the photo time to the GPX time. Then the GPX lat/lon is stored in the photo, but the timestamp is not changed. This is to ensure that you can re-run the exact same geotag command multiple times without getting a cumulative effect. If we changed the timestamp of the photo, then the subsequent runs would need to use "-t 0", or some small offset if you got the first one wrong. It is easier to just repeat the same command with the same timeoffset. @pnorman I see I did not read your entire comment. You also noticed the locations not being affected by -t option. I've used this script a lot and it worked for me, so I did more testing now with exactly your options -t 0 and -t 120 (and put the option before and after the filename). It always worked. However, I can think of a case where it will not work. If the image time is outside the range of the GPX track times, it will attach to the end of the track. For example, if the image is at 12:05 and the track only starts at 12:07, then for all values if -t from 0 to 120 you will get the same location. Can you check the full time range of your track? And that the image time is within that range.